It’s great news for the frequent travelers to Ahmedabad. 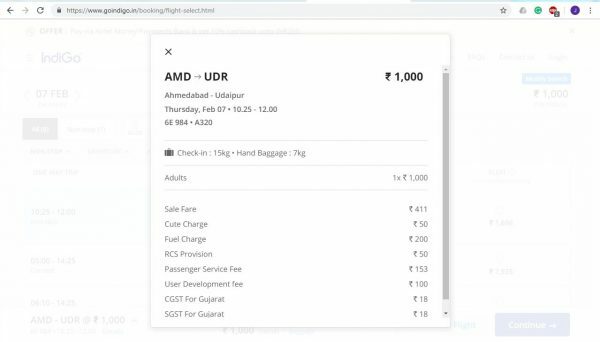 The much-awaited air connection between Udaipur to Ahmedabad is finally established. The first flight will take off on 7th February 2019 which is tomorrow. According to the website of Indigo Airlines, the flight 6E 984 will depart from Ahmedabad at 10:25 am and land in Udaipur at 12 noon. For tomorrow, the prices for the same would be Rs. 1000 for an adult. This one-way connection would be operated on Tuesday, Thursday and Saturday. This schedule will be followed from 7th February 2019 to 22nd March 2019. How do you feel about this new flight connection? Share your feedback with us in the comment section below. Previous articleYou won’t be Able to Escape Now if you Violate Traffic Rules. Read Why! Udaipur is well connected by flights to many major cities in Udaipur now.